A panel of 15 is trying to fix the property insurance crisis. Trouble is, most have ties to the industry. They are 15 men and women, many of them people you've never heard of, who are going to try to save Florida. Sometime in the next few months, they have to find workable solutions to a numbingly complex property insurance crisis that is driving residents out of their homes and business owners out of their stores. They are members of the Property and Casualty Insurance Reform Committee, appointed in June by Gov. Jeb Bush. They have met three times since their inception, and their first report is due by Nov. 15. A dozen Republicans and three Democrats. Eleven men and four women. The Florida chief executive officer of Wachovia Bank and other bankers, a retired schoolteacher, lawyers, developers, three state legislators and the lieutenant governor. But looked at another way, there's a looming problem. Something akin to foxes guarding the henhouse. Lt. Gov. Toni Jennings, chair of the Property & Casualty Insurance Reform Committee, listens as Sen. J.D. Alexander, R-Lake Wales, right, addresses a meeting in August. At least 10 members have either received campaign contributions from the insurance industry, worked for a business linked to insurance or had some other association with the industry. Two members, Frank Kowalski of Miami and Don Brown of DeFuniak Springs, are insurance agents. Brown is more than an agent. He is also a Republican state representative who served on the House Insurance Committee and helped craft much of the Legislature's property insurance bills last session. Among the awards he has received during his career is the Excellence in Government Award by the Professional Insurance Agents of Florida in 2003. Like the two other legislators on the committee, he has received tens of thousands of dollars in campaign contributions from the insurance industry. Is asking people with even marginal ties to the insurance industry to be objective in this mission tantamount to losing your wallet at the beach and looking for it in the mountains? Some people think that's exactly the case. "We know where they're going, it's a foregone conclusion," said Bill Newton, executive director of the Florida Consumer Action Network. "The insurance industry and the developers want deregulation and to let insurance companies buy reinsurance more cheaply from the state, which is just another form of subsidy." Newton said he and other consumer advocates volunteered to serve on the committee, but were turned down. So where is the voice of the consumer? Most committee members say they are acting as consumer advocates, although no one has that specific job. 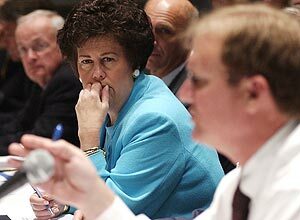 Committee member and former Allstate spokeswoman Leslie Chapman-Henderson serves as Bush's consumer representative on two other committees. But on Insurance Reform, most of her focus has been on making homes stronger through a nonprofit that partners with, among others, property insurance companies. Still, she thinks the committee will keep an open mind as to what will fill the immediate needs of homeowners. "There's a lot of listening to, for instance, a state-funded wind pool," she said. "I don't stand philosophically opposed to anything that fairly and competently resolves this." It's too early in the process to know how the composition of the committee will affect the recommendations it makes. But there are some danger signs for consumers. Skeptics point to a recent attempt by state government to solve the crisis that seemed like something out of a Charles Dickens novel. In the last days of the 2006 legislative session, lawmakers thought the answer was to mail every homesteaded property owner a check for $140, supposedly to defray insurance costs. That idea, championed by Bush and reform committee member Sen. J.D. Alexander, R-Lake Wales, quickly fizzled when it was learned the process would cost the state $4.7-million. Alexander, a member of the Senate Banking and Insurance Committee, received at least $95,790 from the insurance industry for the 2002 and 2004 election cycles. And he is far from the only - to use an insurance term - beneficiary. This year, the property insurance industry has contributed at least $1.7-million to candidates and political parties taking part in statewide elections. The industry also contributed at least $200,000 to Bush's 2002 re-election campaign, which could help explain why he has farmed out this particular crisis. But fear not: Reform committee members insist they can watch out for consumers. Linda Loomis Shelley, former general counsel for Gov. Bob Graham and former chief of staff for Gov. Lawton Chiles, said the committee is headed in the right direction, in no small part because of the direction of its chairwoman, Lt. Gov. Toni Jennings. "I have great confidence that Toni Jennings will be able to do this because I have seen her do this when she was in the Senate," Shelley said. "She has a very sharp intellect and a style that allows all parties to be heard." As for consumer advocates on the committee, Shelley considers herself one, along with Jennings, Chapman-Henderson and retired teacher Barbara Weese . Ultimately, Shelley said, if the solution isn't a strong product, it won't make it through the Legislature. "The challenge," she said, "is to come up with something that is fair to all sides. But it can't be universally saluted. That can't be the goal. If there were an easy answer, it would've been done already." The committee often hears from experts who lay out a wilting barrage of terms that sound like a foreign language to those not familiar with the industry. That can also be to the industry's advantage. Weese, who lives in Leesburg, has been to only one meeting and is trying, she said, to get a feel for what's going on. "I asked to be on the committee, and was surprised to be on it," she said. "Most of them are CEOs or legislators. I don't fit in either of those categories. I'm the only person on there who no one knows why they're there." But Weese knows. She is there because of her affiliation with AARP. She is a regional advocacy coordinator. "I think the committee is beginning to get a feel for things like mitigation and helping people to retrofit their houses," Weese said. "Hopefully, that will get insurance down." Another outsider, Bill Montford, CEO of the Florida Association of District School Superintendents and a former Leon County commissioner, said he's satisfied with the direction the committee is taking. "The lieutenant governor is keeping us on task and in line," Montford said. "The problem is that there's so much to cover and so much to learn. And we're under the gun to move as quickly as we can. "I'm not an insurance expert." But he need not look far to find one. Seated around the table at every reform committee meeting is an 18-member technical adviser committee that's packed with high-level insurance company executives. The advisory committee, appointed by Bush, includes senior officials from Allstate, Travelers, State Farm, American Strategic, U.S. RE, the MacNeill Group and Southern Oak insurance companies. Many of those companies have asked for, and most have received, double-digit rate increases this year. Other members include Dan Sullivan, a Nationwide agent from DeFuniak Springs; John Laurie, a Bradenton insurance agent and board member of the Florida Association of Insurance Agents; and Bert Combs, a Tallahassee lawyer who specializes in insurance law. But, say members of both committees, information is still being gathered, and it would be wrong to assume the solutions that end up being recommended won't be consumer-friendly. "We haven't heard everything yet," said Rockledge Mayor Larry Schultz, a member of the reform committee. "We still have a lot of questions to ask. And I do not presuppose any kind of conclusion." But the committee, he said, is looking in the right direction. "And I hope we find that missing wallet." Jennings, Brown and Alexander did not return calls for comment. But during an appearance in Coral Gables last week, Rep. Juan Zapata, R-Miami, complained that Brown is "in the pocket of the insurance companies." Brown, who has been an insurance agent for 30 years, later replied that he is "not a fan of insurance companies any more than anyone else. ... But I do have a background and understanding of the industry that helps me navigate through a very complex issue." Bush, who leaves office in January, has said he will call a special session of the Legislature to address the issue if there is general agreement in advance of the committee's recommendations. So the financial fate of tens of thousands of Floridians rests, at least in part, with these 15 people. When asked last week why there are no consumer advocates on the reform committee, Bush asked a question of his own. "Do they have any ideas?" he said. "You don't have to be on a board to be able to provide advice and counsel and ideas. "Get back to the critics and say, 'We are anxious to hear their views.' "
Which leads to one more question.